Challah is a rich, buttery bread made for the Jewish Sabbath. 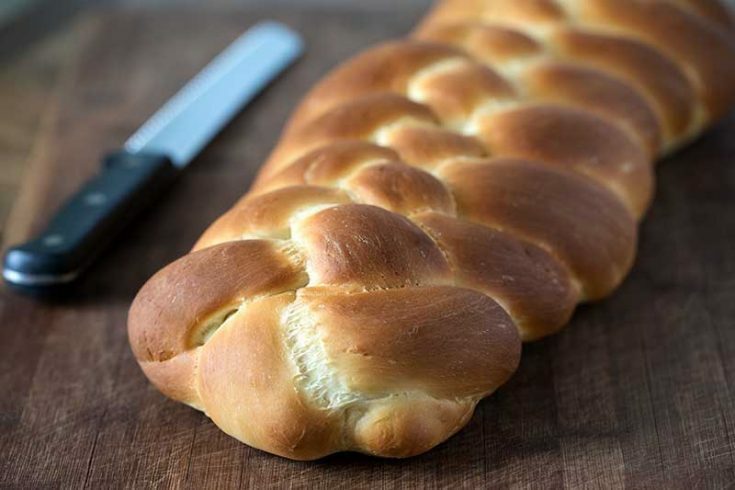 This Ultimate Challah Bread recipe is based on a recipe handed down from one generation to the next. 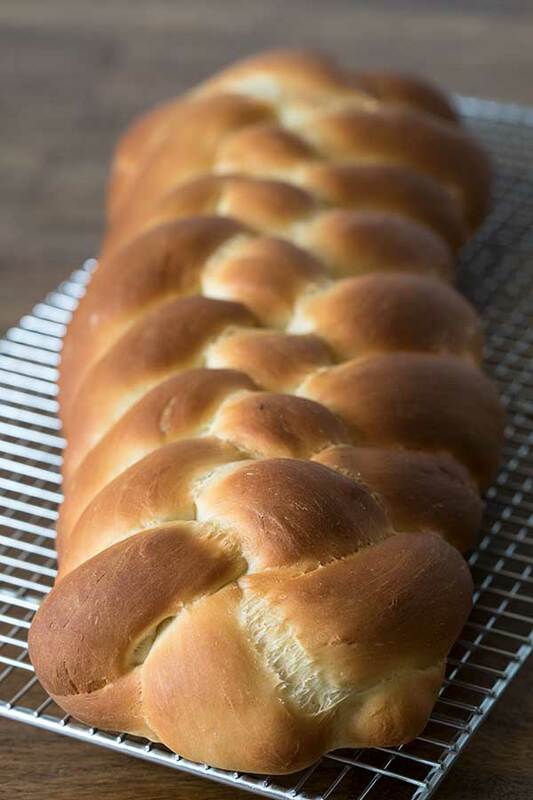 My Ultimate Challah Bread recipe is slightly adapted from the Challah recipe in The Ultimate Jewish Shabbat Dinner by Liz Della Croce. Liz is the creator and author of The Lemon Bowl. This eCookbook is the third in a series of eCookbooks profiling Sunday dinner across America. I named my version the Ultimate Challah Bread because of the title of the eCookbook, but also because this is the best challah bread I’ve ever eaten. Challah (halla, say the ch as if you’re clearing your throat) is the bread eaten on the Sabbath and on holidays. It’s traditionally prepared with white flour because refined flour was a luxury, which allowed all men and women to feel like royalty on the Sabbath. A blessing is said over lit candles, sacramental wine and challah bread as a means of saying thanks to the Creator Of All. 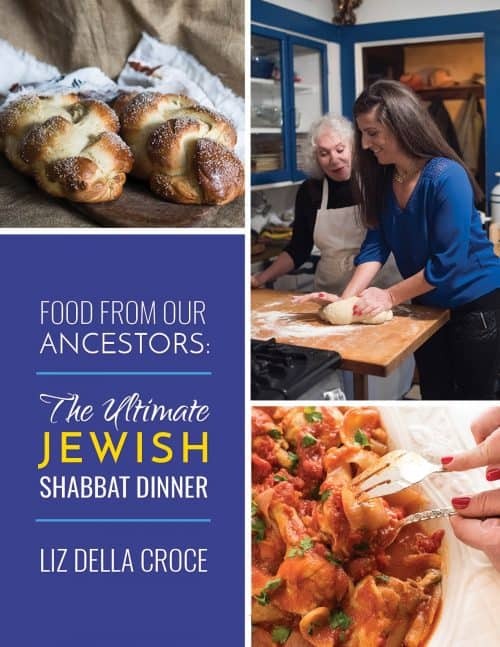 I also loved the story in The Ultimate Jewish Shabbat Dinner about Liz’s grandmother Ljuba. 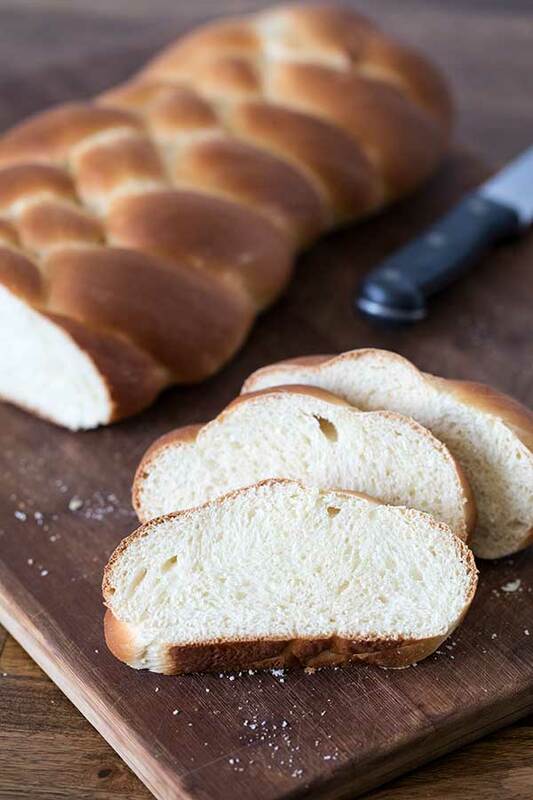 Ljuba is the inspiration for the eCookbook and it Ljuba’s recipes Liz shares, including Ljuba’s Challah bread recipe. The Challah recipe is a wonderful old fashioned recipe, but when I’m making bread, I like my KitchenAid mixer to do all the work. So I changed the recipe into an easier to make mixer dough. The recipe makes two large loaves. My new oven has a a proof setting, so I decided to split the dough in half before the first rise and let the dough rise in two glass bowls in the oven. If have you a large bowl, you wouldn’t need to split it until after the first rise. I decided instead of a 3 strand braid I would do a fun 6 strand braid. Braiding with 6 strands sounds a bit intimidating, but it’s really super easy. Just pinch the strands together at the top and fold them under. Then all you need to do is take the first strand and take it over the first two strands, under the next strand and over the last two strands. 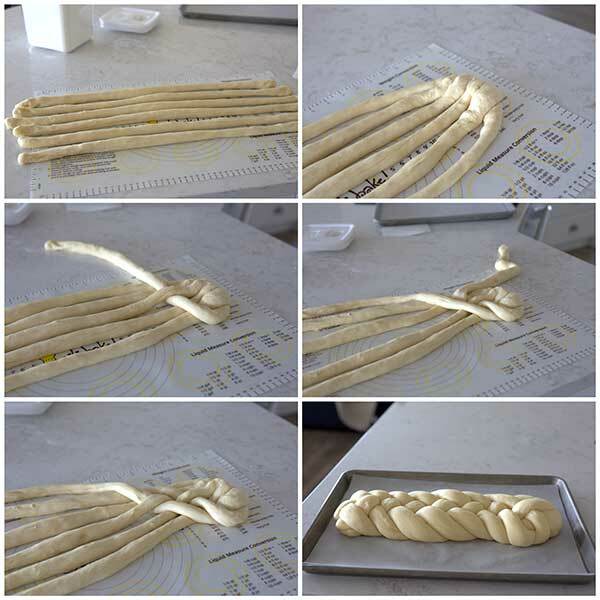 Once you’ve braid as far down as you can, you just pinch the ends together and tuck them under the loaf. Don’t worry if your braid isn’t perfect. Once the bread rises and bakes, it will look gorgeous and know one will care that it’s not perfect. The smell while this braid is baking is heavenly. My family was crazy about this bread. I served a loaf with minestrone soup the first night. The second loaf I sliced and tucked it in the freezer for French toast on the weekend. But it never made it to the weekend, my boys couldn’t resist warming a slice at a time and snacking on it. I haven’t been exposed to very much Jewish food, so the other recipes in the book also intrigued me, especially the Spinach Artichoke Pie, Apple Cake, and Noodle Kugel. You can order the Kindle edition of The Ultimate Jewish Shabbat Dinner on Amazon or directly from The Lemon Bowl. Liz also has a bundle of all three editions of the Food From Our Ancestors eCookbook series, The Ultimate Cookbook Bundle, for just $9.99. In the bowl of a large stand mixer, mix 6 cups flour, sugar, salt and yeast. Add water and butter to flour-yeast mixture. Add eggs. Beat 1 minute at low speed. Scrape down dough from sides of bowl. Beat 3 more minutes at medium speed. Switch to the dough hook and knead for 5 minutes until smooth and elastic, adding remaining 1 cup flour a little at a time; add more or less as needed. Butter inside of large bowl (I divided the dough in half and used two bowls), place dough inside, cover with towel or plastic wrap to rise until doubled in size. Preheat oven to 350 degrees. 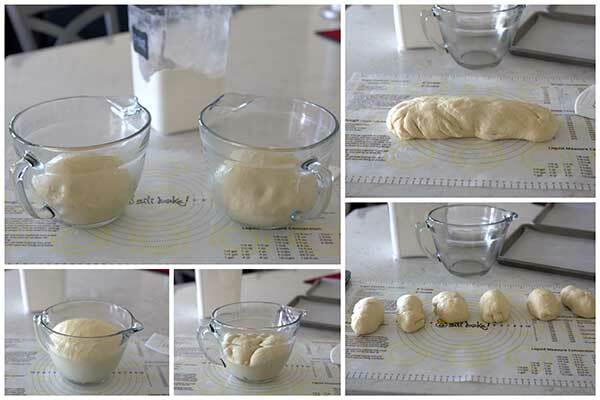 Punch down dough, divide in half. Take each half of dough and divide into 3, 4 or 6 strands, braid, place on pan lined with parchment paper, cover and let rise until double. Brush with a beaten egg, sprinkle with poppy seeds or sesame seeds, if desired. Bake for about 30-35 minutes until golden. (I used the Convection Bake mode on my oven and baked it for 20 minutes until it had an internal temperature of 190 degrees.) Cool completely before slicing. Hi Barbara, My wife no longer cooks or bakes anymore due to her physical handicap from a car accident. So I have taken over many of the duties. I have always been able to prepare meals with her guidance and I am pretty sure I can handle the challah bread, but recently, we have begun following ALL of the scriptures which included the Torah, (instructions), eating clean and observing the Fathers Holy days rather than man’s holidays. My question is very simple for you I imagine. During the feast of unleavened bread, (ULB), any bread recipe’s must not have any leaven in them. How does this change the recipe or should I just forget about challah bread for that week? Why is the pictured Challah bread not yellow in color? Using 4 eggs, I would think it would be. Thanks. Hi Karen – I’m sure it’s all the white flour that makes the bread white. Ended up adding more flour and then basically making a bread bowl type of loaf. I’m going to try it with different flour another day and see. Hi Ciaran – different flours can make a difference in the flour to liquids ratio, but once you have the hydration right, you should be able to divide the dough into pieces and braid into the bread. If you were only able to shape it into a round loaf, perhaps you added too much flour. Perhaps next try use less flour? I was wondering about the yeast, 1 tablespoon is 1 packet,so we use 3 packets? Hi Kathy – yes, I know it seems like a lot of yeast, but you’ll love the results. Hi Barbara! The challah was very rich and buttery — so delicious! However, I have a question: the recipe produced a dough that was very sticky and I am certain I added a lot more flour than the final cup in order to get it workable. Even still, it was sticky, but I stopped adding flour to avoid producing a tough dough. I wonder, when you created this recipe did you “scoop and level” or do you “spoon and level” your flour? I spooned and leveled and wonder if my total flour volume was on the low side as a result. I love the looks of your challah. Do you recommend the book of Jewish recipes? I would love a good brisket recipe and luckshen (noodle) koogle. My grandmother passed away and never had anything written down. All I have are the memories of her cooking for my sister and I. She raised us. So I would love to try some tried and true Jewish recipes. Hi Sandra – I haven’t tried the other recipes in the book yet, but Liz has a large following who love her recipes, so I’m sure you can’t go wrong with any of the recipes in the book. What if I don’t have a stand mixer to knead the dough? I do not see instructions as to proofing the yeast. Potato water and honey or does this recipe not require it. Hi Mary – I rarely proof the yeast in recipes. I prefer the ease of adding the yeast directly to the dry ingredients. How long is a good time to let the dough sit and double size? Hi Angela – it really depends on how warm your house is, but generally about an hour. I can’t wait to try this bread, but my question is: what changes are needed for over 5200 ft above sea level? Hi Pat – I’m at about 5,000 ft so you shouldn’t need to make any changes. Enjoy! Hi, do they use butter in the original recipe? Is there a substitute you recommend to not use dairy? Thanks! Hi Monika – yes they use butter in the original recipe. You could substitute oil if you prefer not to use dairy. Enjoy! Can u bake bread in pressure cooker?? Hi Katherine – some people have baked old fashioned brown breads in a can in the pressure cooker, but I haven’t tried it. Can I cheat and make 2 large (9×5) loaves in regular bread pan? I would like to make this but don’t really want to braid it. Hi Betsy – you can make it in loaf pans, but you’ll probably need 3 pans.